We will once again be at the beautiful Embassy of Luxembourg in Washington, D.C. for our next tasting on Friday, September 28, 2018 at 7 pm (with guests admitted for registration starting at 6:30 pm). The tasting will conclude at 9 pm. 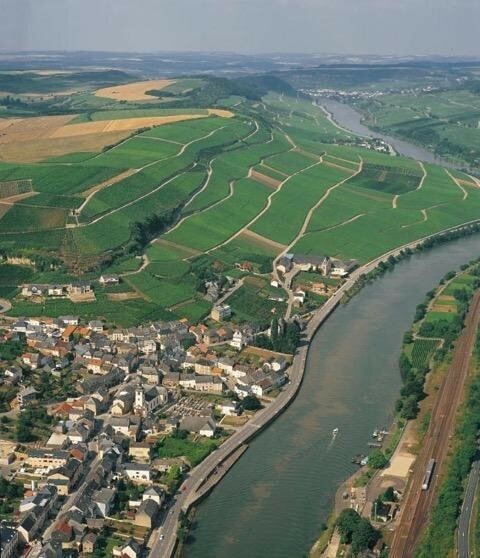 Many of you will remember our very successful events at the Embassy of Luxembourg in 2011, 2013, and 2016, and this provides us with another exciting opportunity to try the varied wines of the “other Mosel,” the Moselle River in the Grand Duchy of Luxembourg. Our host for this evening will be Ambassador Sylvie Lucas, and in preparing for this event we have worked closely with Consul Stan Myck, who has aided us in obtaining all these wonderful Luxembourg wines. And throughout the evening, the Embassy will be serving hors d’oeuvres and amuse-bouches, as well as desserts prepared by the Embassy’s French chef to accompany the wines. The price for this event is $72 for members, and $80 for non-member guests. Registration will be limited to 60 guests, so register early to avoid disappointment. You can register and pay for this event in either of two ways. You can register on our website (germanwinesocietydc.org) and make payment by Paypal. You will need to set up a GWS account if you have not done so already for past events, and have a Paypal account. You can also pay by check, made out to the German Wine Society, and mailed to the GWS Secretary, Joseph Aguiar, at 1130 45th Place SE, Washington, DC 20019, along with the completed form below. The deadline to register for this event is September 25, 2018, as we must provide a list of guests to the Embassy for security reasons several days in advance of the event. There will be no admissions at the door for those who have not registered in advance. The Embassy of Luxembourg is located at 2200 Massachusetts Avenue, N.W., Washington, D.C. 20008, within easy walking distance of the Dupont Circle Red Line Metro station. Street parking in the area is limited, so planning to arrive by Metro is likely to be easiest. All GWS members and guests are reminded that alcohol consumption can lead to intoxication, and therefore Society members and their guests are expected to drink in moderation at Society events. Members and guests should use public transportation, rely on a designated driver, or mostly taste the wines rather than finish them when such drivers or alternative modes of transportation are not available. The coordinator for this event is GWS Capital Chapter, President Carl Willner, who can be reached at 202-674-9044, or at carl.willner1@verizon.net .